VA (Voice Alarm) or PA/VA (Public Address/Voice Alarm) audio systems are now common place in large public spaces & transport facilities. A well designed and commissioned system can provide a highly effective means of communication with the public. The primary purpose of such systems is to communicate information when an emergency arises, thus clarity/intelligibility is of the utmost importance, so that people can move to safety as quickly and effectively as possible. To achieve this, an STI (Speech Transmission Index) of 0.45 to 0.5 under all conditions is recognised as the minimum desirable standard. Furthermore, the system should have a configuration which is sufficiently robust to make individual component failures tolerable. In addition, comprehensive monitoring of the status of all system components, fault logging and reporting, a method of storing standard emergency (and non-emergency) announcements, a flexible set of audio processing techniques, and a simple, centralised point of system control and monitoring are all clearly desirable. Duran Audio are the experts in this field. We introduced the Intellivox range of DSP-based active loudspeakers in the mid-1990s, which have since been installed in many major public spaces worldwide, setting new standards for speech intelligibility. 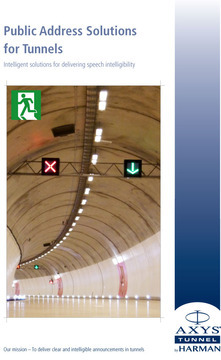 In 1999 we introduced the ABF-260 tunnel horn loudspeaker, specifically designed for use in the extremely hostile environment of public road and rail tunnels. Since then, our product portfolio has been expanded further, and now includes a range of complementary audio components which may be used in combination with our loudspeakers to produce a system able to deliver the maximum intelligibility with the utmost reliability.